A Mechanical background in Engineering didn’t stop Soham Acharya from being deeply interested in Computer Science. Infact, when he quit his job at Ola in 2015, pursuing a Masters degree in CS was somewhere on the cards. Life had different plans though. When he ran into Venkatesh Mondi, an IIT-M graduate and Saurabh Arora, his best friend from NIT Rourkela, coincidentally at the same time, they put their heads together and decided to make machines smarter. Their first baby, Project Spammart was conceptualised and initiated to clean all unsanitized images in the Web “by generating contextual meta tags and sentiment-based content distribution to facilitate local commodity discovery”. Dismissing it now as a “Couple of sleepless nights of drunken code marathons to stitch together sentiment analysis and image similarity algorithms”, Soham says that’s how they first fell in love with media files. “Our first revenue came from a small project where we built a simple graphical user interface to train an ensemble of CNNs”. Serendipitously for them, Ronak Samantray (Co-founder and CTO, NowFloats) decided to use it to train models to generate meta tags for images uploaded by merchants on NowFloats. NowFloats uses Natural Language Processing to bring SMEs online and optimizes them for search engines. “We didn’t have a company registered then so we had to go and register a company to get the first cheque from NowFloats and thus NicheAI started as a company,” recounts Soham. Withemerging tech or niche tech as the buzz words going around then, Soham says they zeroed in on the name NicheAI. “We didn’t want the domain name extension of Anguilla,” he grins, and hence NicheAI.com was formally created. Ronak has since onboarded as an advisor to NicheAI. While scouting around for more complex use cases, the trio zeroed in on toll booths in India. Typically there exists an unholy nexus between drivers and toll operators where heavy vehicles such as trucks are issued receipts (of lower value) meant for cars. This is responsible for hundreds of crores of loss in revenue for the Government. 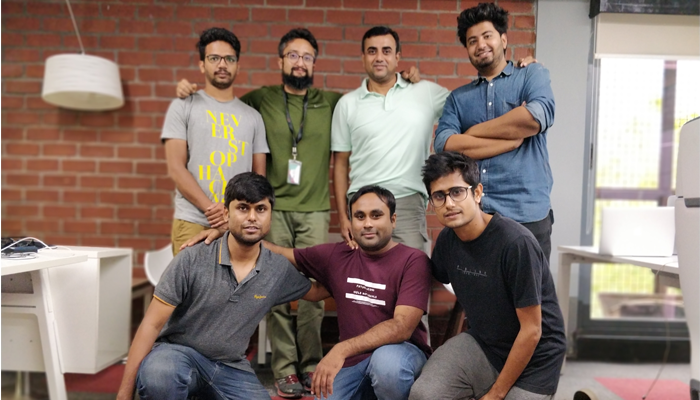 The NicheAI team created an AI model that analyses CCTV camera footages at toll plazas to keep a count of the kind of vehicles that passed through and the time at which they passed. Though it looks like an easy video classification problem, Soham says that they realised soon enough that unlike theory, real-life problems in computer vision don’t follow textbook scenarios of meeting all test conditions. “The very first condition of getting clean and good data for training was non existent!,” exclaims Soham. Changes in weather, seasonality, natural conditions such as exposure to sunlight, erratic glare, or man-made interferences such as changing the angles of cameras or covering them in plastic sheets made building and maintaining an AI model for this problem a herculean task. Compounding the problem, reinforcement learning degraded the models rather than improving them because of prevalent fraud and continuous mistags by the human validators sitting at the top of feedback loop in the toll industry. Furthermore, in unconstrained conditions it is impossible to stop classes of objects outside your training categories from coming in. For example, the CCTV camera capturing the feed of a dog at the toll area. Developing “vanity checks” to plug out such samples was an interesting IP NicheAI developed. In addition to this, internet at most of the toll plazas is non existent. “You can’t go for a cloud-based solution nor will you be able to monitor the heterogeneous cluster of hardwares doing the processing at edge there”, says Soham. Bhaskar, Venky’s friend from IIT-M who had worked extensively on implementing AI for anomaly detection systems of Orbitpay and HSBC joined team NicheAI at this juncture and became the “messiah for the toll product”. Bhaskar developed many IPs pertaining mainly with unsupervised learning techniques to handle the noisy data, to flag network and model behaviour anomalies, and reduce turnaround time for rolling out in new lanes with minimal effort. The team currently has the model deployed in 30 toll plaza lanes across Kherki Dhaula toll plaza which separates Gurgaon and Manesar. Bhaskar was able to stabilise all the lanes with an average accuracy of 95% which is a leap in the accuracy benchmarks set by all other systems for this use case. “Getting AI into the infra sector involves introducing an industry shift in itself, which starts with improvement of the existing hardware and software infrastructure. The deep learning space in the world right now is quantum and you have to warp the space if you want to come out alive. With that in mind, we decided to withhold further deployments even though we had contracts to scale and could make money from this sector. Plus, the team’s engineering proficiency and the IPs developed while solving this problem opened up a plethora of newer and much bigger avenues.” quips Soham. From their experience they concluded that classification was more or less a solved problemand started experimenting with and tweaking a new loss function (focal loss) for single shot detection networks. They did this to increase the networks generalization capability across easy and hard examples. NicheNet has shown really promising results on COCO dataset and other real life problems where it has been implemented. With NicheNet in place, the NicheAI team started exploring use cases where fast and precise detections are a bottleneck. “We picked the auto insurance sector where AI can be used to disburse accident claims from images and videos, “ says Soham. The way it works is that from a picture of the vehicle, NicheInsure detects the parts, damages on them, extent of damage and based on the historic claims data decides whether to replace or repair a part and calculates the final claim amount to be disbursed accommodating depreciation, taxes etc. They are currently in advanced round of talks with several big insurance players both in India and abroad. Next, the team decided to deploy their deep learning algorithm on edge for large-scale real time surveillance. It can Identify brand, colour, model, make and license plate number of vehicles. It can also identify face, gender, ethnicity, relationship between people and track their gaze. “Though the principle used in detecting a damaged part is similar to detecting a helmet on a head (or not), a lot of work on enhancing the quality of image to capture minute artefacts in these use cases is where our R&D efforts are directed”, explains Soham. The algorithm here detects not just the helmet-less head, but also the number plate and then extracts that from the footage for issuing a traffic violation challan. In this way the algorithm finds application in the detection of traffic violations such as two-wheeler riders without helmets, movement in the wrong direction, 2 or more pillion riders, other security breaches and violations to raise flags and make this world a safer place. “We are currently training data given to us by the Telangana State Police and hope to eventually deploy our model across 30,000 CCTV cameras in Hyderabad alone”, says Soham. Project Grace, named after the famous computer scientist Grace Hopper, the programmer to design the first machine agnostic programming language COBOL, is the flagship product of NicheAI. Soham explains it as a machine generated machine learning framework to help productionize, scale and maintain deep learning projects. Since patent filings for Grace are currently in process, Soham ruefully regrets that he cannot disclose much about the product. NicheAI is currently working with IIIT Labs to take some of their projects out of Lab into production using Grace. IIIT-H’s Product Labs initiative was launched in January 2018 to push innovation by identifying commercially viable prototypes of research. Deep tech has its roots in academia and Soham acknowledges that constant touch with professors and developments in the lab is very important. However, according to Soham, there is a gap in computer vision that goes into production in academia and the team would like to bridge this gap. “What would probably work as part of a dissertation thesis typically doesn’t stand a chance in the real world, “ muses Soham. The team has now expanded to 8, all of them engineers from premium institutes who bring with them experience from working at various tech companies such as ISRO, Google Mountain View, Ola, Group M, Alacrati, and NowFloats. “We have Debiprasad Banerjee, an engineer who shifted to management after years in tech, as our Chief Strategic Officer to make sure our team doesn’t go too crazy” laughs Soham. Their advisors include Pratyush Prasanna, a former innovation manager of Xerox and Microsoft, founder of Plustxt that was acquired by PayTm and Ronak Samantray Co-founder and CTO of NowFloats. The company recently closed its angel funding from IIIT-H Seed Fund, Times Internet, IIIT-H Foundation and other HNIs. “Edge deployment or hosting sophisticated software on local hardware, is what we’re talking about. We want to make it extremely simple to deploy and maintain that. The next logical step for us would be to move into robotics. It’s one thing for a machine to look at a photo and analyze it and it’s quite another for it to take automatic action based on the analysis of the photo. Complete AI-powered vehicular garages is a near future reality rather than an Elon Musk fantasy. That is where AI is heading,“ affirms Soham.